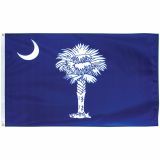 South Carolina flag was in existence since 1775. The Revolutionary Council of Safety wanted a flag to be designed for the use of South Carolina troops and Col. William Moultrie chose this design of an indigo field flag that features a White palmetto tree. The canton contains a white crescent. Our South Carolina Flags are made 100% in USA and carry a guarantee of 6 months on construction.Shop from our complete line of South Carolina Flags right away and avail the best prices, quick shipping and much more! 100% customer satisfaction guaranteed! 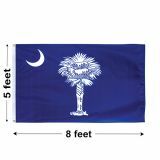 Our South Carolina Flags are offered in all standard sizes that range from 3’x5’,4’x6’,5’x8’,6’x10’and 8’x12’ and are offered in two fabulous fabric choices of nylon and fabric. The light weight and quick dry nylon flags will make perfect daily use outdoor flags while the heavy duty 2-ply polyester flags will be more suitable for high wind conditions. Finished with heading and grommets, these flags will make perfect gifts and collectible. Celebrate your state pride with our indoor flags, outdoor flags or indoor flag kits, which will cater to even the most diverse flag presentation needs. 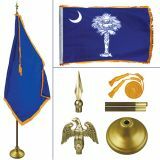 Browse our complete line of South Carolina Flags at attractive rates. Should you need any assistance, call our toll free number (888) 287-3524 or email at customercare@tuffflags.com.